Here’s a problem you want to have: what to do when the market can’t get enough of your product and you’re on a budget? Well, if you’re smart, you get crafty. And General Motors has done just that with its Chevrolet Equinox and GMC Terrain crossover vehicles. With the CAMI plant in Ingersoll, Ontario already running three shifts with maximum overtime and not quite enough time and money to add shifts to other plants, nor to consider reactivating a dormant one, there was little else to do. So, GM had to figure out a solution that held the combination of being effective, affordable and could be done in a pinch. What they came up with is pretty good. Turns out there was enough space in the Ingersoll plant for trucks to dock in, load up a full trailer of five Terrain and Equinox bodies, and shuttle them two and a half hours away to Oshawa, where paint and final assembly will take place. 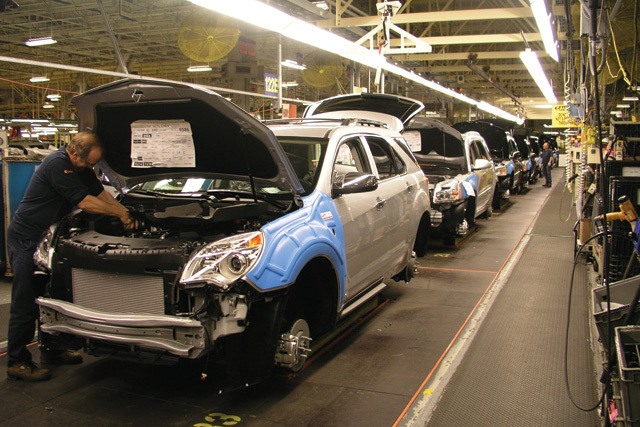 This method allows for an additional capacity of 60,000-80,000 Terrain and Equinox models to be assembled and shipped off to product-thirsty Chevrolet and GMC dealers. The General has been doing this since March, but we have to wonder whether there’s a more stable long-term solution in the works. Any takers? With the reported two week shut down of Oshawa beginning 9/13, what will happen to Terrain production? I have order # PBCDF9 which just moved to 3300 with no production date yesterday. I had to ASK the dealer to cancel the 2010 ordered in March and replace the order in July with an order for a 2011. I have the feeling my dealer was not honest with me in March when we discussed availability. He did not mention quota!